The thermal radiation consisting of ultraviolet rays, infra-red and light rays follows a nuclear explosion which creates a tremendous amount of heat, comparable to the interior of the sun in a volume of space a few inches in diameter. Because the reaction is completed in microseconds a violent explosion results. Near the hypocentre the temperature of 6,000 degrees centigrade incinerates the body, blisters tile surfaces and instantly ignites flammable objects. 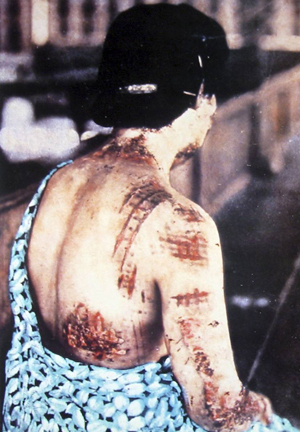 At distances of about three kilometres the skin is charred, but at distances closer to the hypocentre, internal tissues are injured as if they are roasted and death occurs immediately. As thermal radiation and the penetrating nuclear radiation of gamma rays and neutrons act upon the body simultaneously, the combined effects were lethal for those out in the open within 1,500 meters of the hypocentre, even for those who were not injured by the trauma.